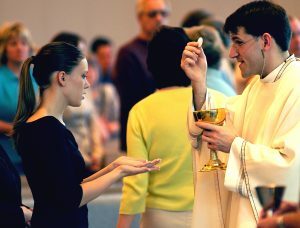 The Mass or the ‘liturgy of the Eucharist’ has two parts that together form ‘one single act of worship’: the Liturgy of the Word and the Liturgy of the Eucharist (CCC 1346-1355). In the Liturgy of the Word Christ is present to us in the word proclaimed. In the Liturgy of the Eucharist Christ gives us the very body he gave up for us on the cross, the blood he ‘poured out for many for the forgiveness of our sins’. For children entering 2nd grade or older who would like to begin preparing to receive First Communion, please contact Stacey.